The Edge Cutoff trail is part of the 18 Road trail system located in the North Fruita Desert Area north of Fruita, Colorado. The trail provides an alternate route between the Edge Loop and the main trailhead. 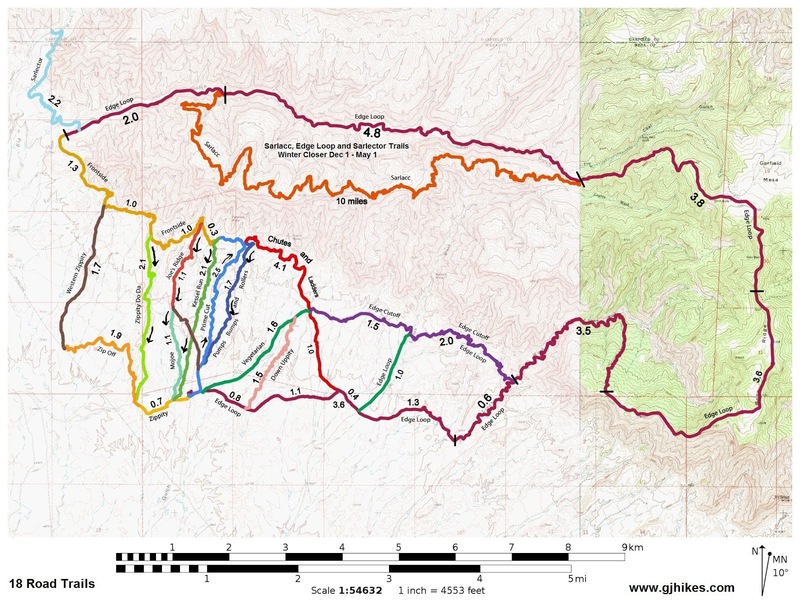 Maps of the 18 Road trails show the Edge Cutoff as a 1.5 mile stretch of singletrack between the Layton Wash Road and the Chutes and Ladders trail. We are adding the 2 miles of singletrack between Lipan Wash and the Layton Wash Road. 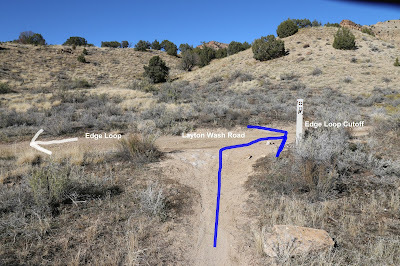 The trail markers on the east end of that 2 mile segment in Lipan Wash are labeled Edge Cutoff while the markers on the Layton Wash Road are labeled simply as the Edge Loop. Mountain bike trails seem to be in a constant state of flux so it is hard to say whether it is the maps or the trail markers that are more correct. 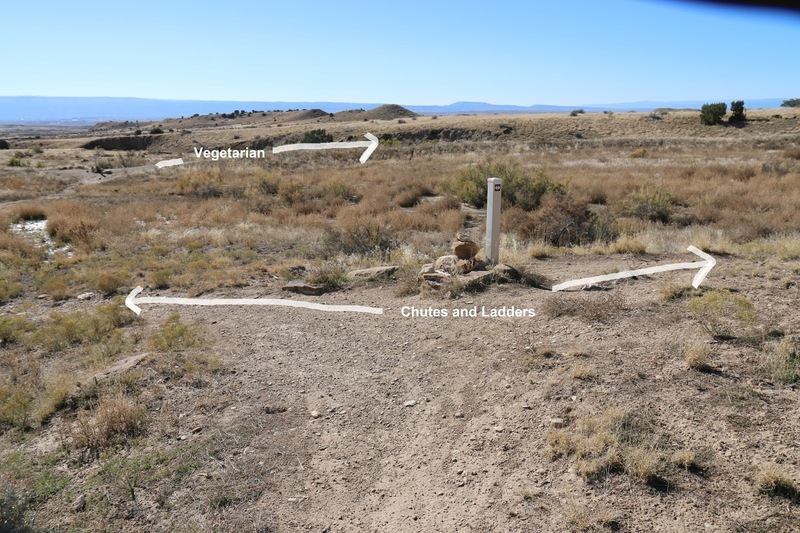 We believe the trail marker in Lipan Wash is newer than the one in Layton Wash so for now we will go by it. As the Edge Loop comes out of the canyon at its 23.8 mile point there is a marker on the right that reads Edge Cutoff. The marker a little further down the wash is labeled Edge Loop. This post begins by following the trail out of the wash at this point. After climbing up onto the bank of the wash the trail heads west along the base of the hillside. 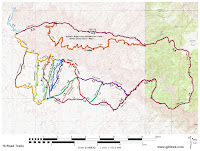 As can be seen by a map of the trails profile there are quite a few ups and downs. Even with all of that the overall elevation gain is less than 700 feet. After skirting around the base of the hills and encountering one of its first up and down spots the trail finds a narrow wash to run up. 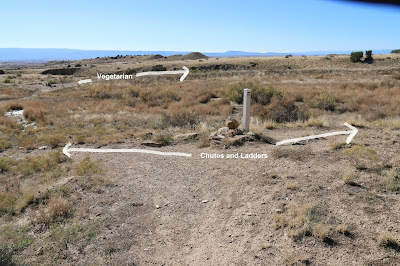 The place where the trail leaves the wash is marked by a cairn. As you might expect, the only way out of a wash is to climb your way out which in this case is moderately steep but very manageable. That next stretch of trail is a nice and easy run. There are a lot of minor washes that all drain into either Lipan Wash or Layton Wash.
Each one has a small hill on each side. All total there are about 8 different drainages in this 2 mile stretch. When the trail isn't popping in and out of washes it is blasting around small hills and through the junipers. The Layton Wash Road comes up at the 2 mile point. From here there is the option of following the road to the left and continuing on the Edge Loop. That portion of trail follows the road for 1 mile before it picks up the singletrack once again and continues toward the trailhead. For the Edge Cutoff follow the road to the right for a hundred yards or so. The spot where the trail leaves the road and climbs out of Layton Wash is well marked. After the initial climb the trail crosses a flattop ridge. The trail is an easy ride for the most part. There is one deep gulley though that takes a more advanced set of skills to transition through without stopping. There is only one more little hill before the trail comes to an end at its junction with the Chutes and Ladders trail. The quickest route back to the trailhead from here is to go to the left for less than 50 yards and pick up the Vegetarian trail which is 1.6 miles one-way with another 2 or 3 tenths to tack on to get up the hill to 18 Road. With a name like the Edge Cutoff you might be left with the impression that it is a shortcut but from Lipan Wash it is 1 tenth of a mile longer and from Layton Wash the distance is the same. Shortcut or not the Edge Loop Cutoff is a nice trail and fun to ride. If you would like to see it for yourself then all you have to do is grab your bike or 'Take a hike'.